1. Seychelles Lori Penny Western Bootie: These come in 3 other colors! I love how the ankle is a little higher, and the zipper detail! 2. Frye Melissa Riding Boot: Frye for the win! I am a Frye girl for sure and these are SO perfect for fall & winter! 3. Matisse Mustang Cowboy Boot: These are such cute little booties to pair with a dress or jeans! 4. Lucky Brand Eadon Boot: Love the slouchiness of these! They also come in a lighter color as well! 5. Amuse Society x Matisse Society Bootie: Love the western vibes these give off! They are so cute and come in a few other colors! 6. Lauren Ralph Lauren Meira Bootie: A classic ankle bootie!! I love the wrap detail! 7. Rag & Co Eva Bootie: These are gorgeous! I am really tempted to order them! The dark brown is so pretty and classy! 8. Sam Edelman Mathia Bootie: I love how light these are! These would pair well with SO many outfits! 10. Franco Sarto Izzy Bootie: How chic are these!? I can just see them with a cute mini skirt and oversized sweater! They come in brown and black as well! 11. Steve Madden Jain Bootie: OK im in love with the snake skin! I ordered these as well and CANNOT wait to get them! 12. Charles by Charles David Poca Bootie: How sassy are these!? I'm obsessed! Love the red! 13. Franco Sarto Bette Bootie: Ordered these pretties as well! Leopard is making a HUGE come back this season and I'm not mad about it! 14. Steve Madden Purly Over The Knee Boot: These are the perfect OTK's! The fall temps are starting to show up and I am thrilled! I feel like I have been waiting so long for it to get here! Last weekend I pulled out my boots and booties and sweaters and jackets and was just so excited! 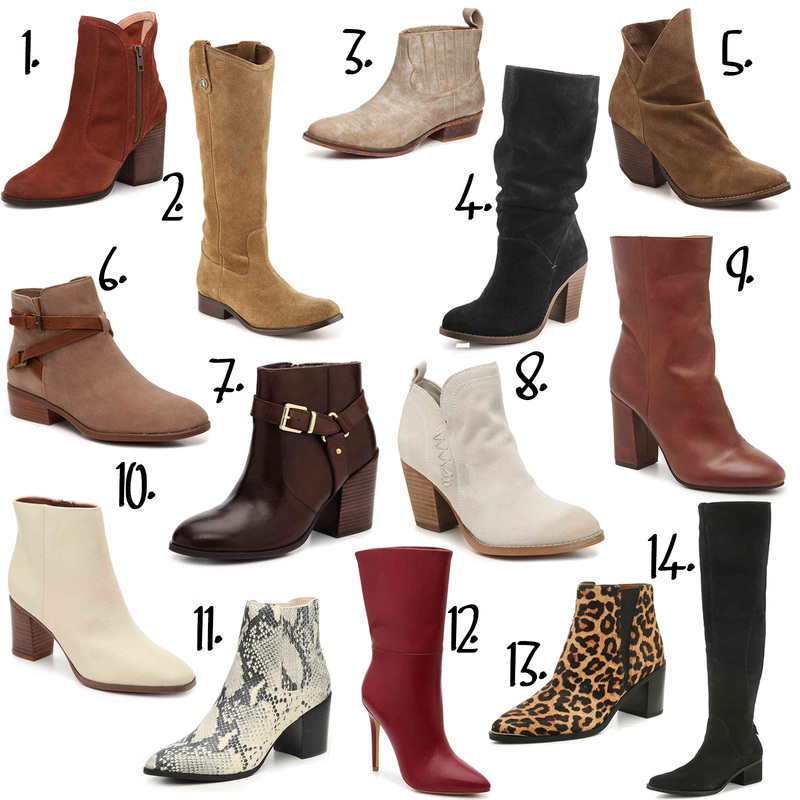 I love wearing boots so I knew I had to round up some of the cutest ones of the season for you guys!